These are the primary diagnoses I received prior to beginning treatment with DNRS: Lyme Disease, Babesia, Bartonella, Fibromyalgia, Chronic Fatigue Syndrome, Mycoplasma Pneumonia, Pyroluria, food intolerances, and Hashimoto’s Thyroiditis. Before I began using the DVDs for DNRS, I had been treating with a wonderful integrative doctor who really knows her stuff when it comes to the conditions I was facing. The treatments she prescribed did help, but they only went so far to provide relief. My lack of significant improvement was discouraging. My doctor really listened to me and cared, but the diet changes, medications, and supplements, while all valuable parts of my healing journey, just didn’t seem to be enough on their own to get me back to fully functioning. There were still missing peaces to the puzzle of my health issues. I knew something needed to change or I wasn’t going to be able to keep going – with treatment, with my relationship with my boyfriend (my health was taking a HUGE toll on things! ), and with life in general. It was that bad. After praying about my current life situation and making a decision to keep renewing my mind in the truth of God’s Word, I did more research about treatment, hoping I’d find something else to help. Soon after that, I came across a friend’s blog post about her experiences with DNRS. At first, I wasn’t interested. I assumed it would be another positive thinking, “manifest what you want” kind of thing (IT’S NOT!). As a Christian, I tend to be cautious of the self-help industry’s Eastern religious influence. I didn’t want to get into something that contradicted my faith. But I found that DNRS is a neuroscience based program with a focus on reducing chronic stress on the limbic system. It stops the fight or flight response in your body so that all systems can begin to work properly again. The stress response on bodies with chronic illness is unconscious. It isn’t caused by us and it isn’t our fault we’re ill. (READ THAT AGAIN!) It’s not your fault that you’re sick. You didn’t just “think the wrong thoughts” to make yourself sick. I’ve learned by studying neuroplasticity that limbic system dysfunction (which includes the chronic fight or flight stress response) can be brought on by factors such as viral or bacterial infections, emotional stress (from the past or present), mold or chemical exposure, physical injury, or psychological trauma (death of loved one or divorce). By reading information on the DNRS website and watching video testimonials, I learned that limbic system dysfunction is often brought on by a ‘perfect storm’ of contributing factors. No matter what those contributing factors are, we can take what is known about neuroplasticity and brain retraining to help ourselves recover! Essentially, DNRS teaches that something beyond your control (like an initial illness) triggered your brain to go into overdrive and cause a stress response that resulted in chronic illness. But there are tools available to help you rewire your brain so it is working properly again and you can heal! Once I had done A LOT of research, I decided to order the DVD Program of the training. The decision to purchase the program was easy once I learned about the Money-Back Guarantee! They don’t just sell this program; they guarantee it. If you commit to the program for 6 months without significant results, you can get your money back! That speaks volumes to the effectiveness of the program. At $250+, it was an investment, but I was already spending hundreds each month on medical expenses. If this helped to lessen the cost of other treatment, I was on board! As always, please remember: The information on this website has not been evaluated by the FDA and is not intended to diagnose, treat, prevent, or cure any disease. I am not a doctor and am not offering medical advice. This website is available for informational purposes only and should not be used for treatment. Medical treatment should always be supervised by a doctor. Depression lessened – I was happy, genuinely happy for the first time in a long time! Less anxious about social situations – was able to communicate clearly and actually have fun! I began to make plans with people and was able to follow through without worrying about illness getting in the way! My relationship with my boyfriend actually became stable! We could finally have open, honest conversations without my brain spiraling out of control. And you know what?! He proposed! The difference in my life before and after DNRS is night and day! Now, when I do have some bad days (which aren’t nearly as bad as the bad days before DNRS), it’s not as big of a deal because not every single day is bad. Before doing the brain retraining program, I only had about one or two good days a month when I could go out and do something. And even then, I was still experiencing symptoms. Now, the bad symptom days are infrequent. I’m gradually seeing myself recover faster from symptom flares. To back up the things my boyfriend (now fiancé), Jonathan, and I noticed in my health, at the last appointment with my integrative doctor (just two months into DNRS), my inflammation was down, lymph nodes were not swollen anymore, spleen was finally normal size, balance was MUCH improved, and the rest of my physical testing showed significant improvement. While the Dynamic Neural Retraining System has helped cause huge shifts for me, I don’t want to put this information out there as a magic “cure all.” It has helped a whole lot, but there are a lot of other things I do to support my body and mind as well. Eating well, sleeping, exercising, renewing my mind in God’s Word, maintaining strong relationships, taking supplements, etc. are all important! I needed all of those things in addition to DNRS. And honestly, DNRS actually helped all of those things help me more. Because of DNRS, I get better sleep, am able to exercise, have the mental energy to read the Bible more, have stronger relationships, and am able to digest food better. When I say that DNRS is helping me heal from Lyme Disease, I mean that’s it’s helping me heal. I’m not all the way healed yet, but my quality of life is vastly improved than it was before I began the program. I still have progress to make in order to be “all better,” but I cannot deny the fact that DNRS has helped me to live life more “normally”! It is an incredibly valuable program! All the treatments work together to create results, but I truly believe neuroplasticity techniques was a tool that was missing from my treatment protocol. Using DNRS has been a game-changer for me! The links in the post are affiliate links. This means if you choose to purchase DNRS, a small portion of the sale (at no added cost to you) will go toward keeping this site running. 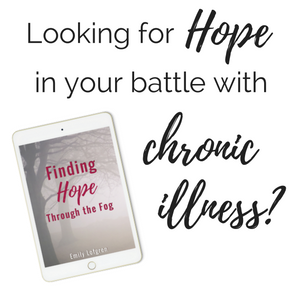 I love being able to provide free content on this site for those who are facing chronic illnesses, so purchases through my affiliate links are a big blessing!!! If you want to explore DNRS a bit more and then decide to buy it later, I’d really appreciate it if you use my affiliate link: https://emilylofgren.com/brainretraining. Thank you for your support! I’ll be excited to hear how the program works for you! Thank you for this post. I have been doing the DNRS program for several weeks now and I am seeing a slight improvement, but just curious if it is still working for you? I so want to get better from all my chronic illnesses and although I don’t expect a miracle, I do hope it will make my life more functional. Thank you again. Thank you so much for sending me your link. And thank you for taking the time to respond. I am so happy that you have found healing………. Hi Emily, I did the DNRS Seminar and have already noticed improvements. I was curious on what percentage you feel you were healed before doing DNRS. Congrats on your success and thanks for sharing! Hi Kim! I’m so glad to hear you did the DNRS seminar and have noticed improvements! Before starting DNRS, I was at nearly rock bottom. I had seen a little improvement but then things went back down before I started DNRS. Thanks so much!! Hey, thanks so much, Jenn! Great to hear your perspective as a neurology professor! :) The more I study resources about the limbic system and the brain’s power in healing the body, the more I’m convinced of the benefits of this program. The changes have really been night and day, and I can’t wait to experience more results as I keep doing it. Glad you’re going to check it out! Thank you for praying – I’m lifting you up in prayer right now. So what exactly is it? What is a typical “exercise” for this program? Hey there! I just wrote a post to answer more questions about the program: https://emilylofgren.com/answering-questions-dnrs/ Hope this helps! I can’t tell exact things because it’s copyrighted, but this gives an idea of the types of things in the exercise of the program.